The LSU Tigers are one of the hottest teams this side of Tennessee not only in the SEC but also in the country. LSU is boasting a 10-game winning streak, a 7-0 mark in SEC play, and a 17-3 record. The Tigers are ranked No. 19 in the AP poll and No. 16 in the NCAA NET Rankings. It’s hard to argue with the NET ranking if statistics are your end-all and be-all, but I personally think the Tigers are underrated right now, and perhaps more than any other upper-division SEC team, the Tigers have room to improve. Tennessee (19-1, 7-0 SEC) deserves its No. 1 ranking in the AP poll, but the Vols are what they are right now. They are playing outstanding ball, but I’m not sure they will be able to crank it up another notch come tournament time. They remind me of more than a few Kansas and Arizona teams in the past that played their best ball in January and February but did not have an extra gear for March Madness. It’s yet to be seen, but LSU and Kentucky (17-3, 6-1 SEC) are two teams that are already playing well, but still have some ceiling to their game. Whether either will reach it, remains to be seen. Obviously, the Arkansas Razorbacks (12-8, 3-4 SEC) have their work cut out for them with their trip to Baton Rouge, La., to play Will Wade’s Tigers. 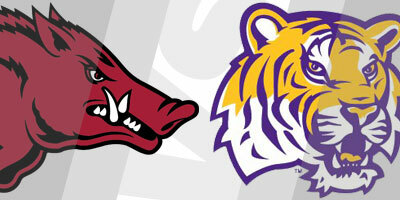 Tipoff is set for 5 p.m., and the game will be televised by the SEC Network. The Razorbacks, which defeated Georgia, 70-60, on Tuesday, played one of their best games of the season when LSU visited Walton Arena on Jan. 12, but the Hogs still lost 94-88, letting the game slip away with two bad defensive lapses early in overtime. Daniel Gafford had his best scoring night with 32 points on 13 of 19 shooting from the field and 4 of 9 shooting from the free-throw line. Wade gambled that his big men could give Gafford enough trouble one-on-one in the paint that he could extend his defense and smother the Hogs’ youthful guards. The Tigers did win the game, but on reflection, was the gambit the right move? We’ll see what Wade thinks by how the Tigers play Gafford on Saturday night. My guess is that Gafford will see more double teams than he did against the Tigers a few weeks ago. If that is the case, Hog fans need to hope Mason Jones is hot and that Isaiah Joe has shaken off the illness that has bothered him the last two games. Joe did not shoot well against the Tigers in the first game, making on 2 of 5 shots. No doubt a Razorback upset effort would be aided if Joe’s stroke heats up. But, taking down a team like LSU isn’t only about offense. It will take a total effort, according to Arkansas coach Mike Anderson. “On the road you’ve to make shots,” Anderson said. “You’ve got to make shots, you’ve got to defend, and get to the free-throw line. Our bench has to play well. We have to play efficient basketball. 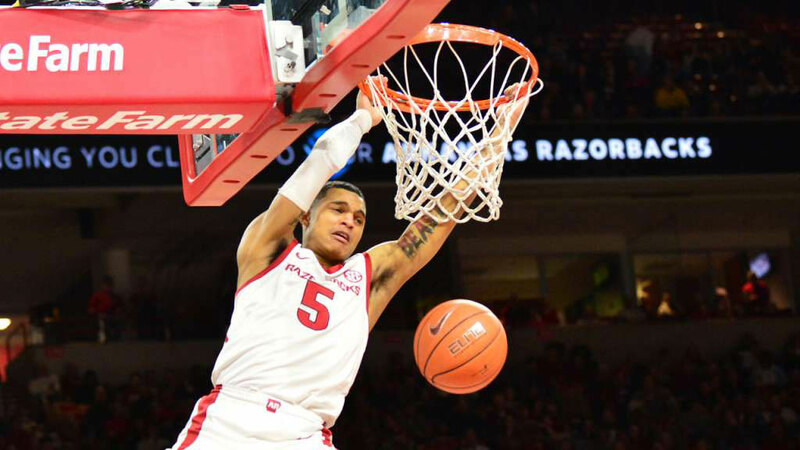 Anderson said the Razorbacks can ill afford another slow start against a team as talented as LSU, particularly when playing on their home court. The Razorbacks got solid play from the trio of Reggie Chaney, Adrio Bailey, Gabe Osabuohien at the forward position in their victory over Georgia, and Anderson said they need to perform even better against the Tigers. LSU’s lineup is filled with talented players like 7-foot freshman Naz Reid, who hit 4 of 4 treys and scored 27 points against the Hogs in the earlier game, and guard Marlon Taylor, who burned the Hogs for 21. However, the straw that stirs the drink is sophomore point guard Tremont Waters, who has a sweet stroke from behind the arc and a witheringly quick first step that allows him to set the table for his teammates like no other guard in the SEC. The Razorbacks will use a variety of defenses against the Tigers like they do every opponent, but Arkansas’ has show improvement with their match-up zone, and it could play a role against the Tigers. With LSU riding a 10-game winning streak, it’s about time some team brings them back down to reality. I’m just a little unsure if the Razorbacks are a team that can accomplish something like that at this point in the season?